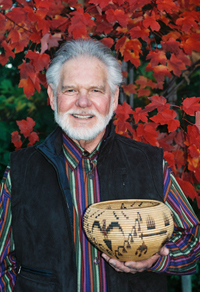 Gene Quintana, a native of Sacramento, California, has been a collector of Native American Indian baskets since 1980. He lives with his family in a suburb of Sacramento, Carmichael, and often spends several months a year at his home at Lake Tahoe, California. He had an early appreciation for art and was able to enjoy collecting Chinese works of art as a hobby while he was building automotive parts distributorship in 1963. He later found that he had acquired a real interest and love of Native American Indian Art, especially basketry. After selling his automotive business in 1993, one of the three largest automotive parts distributors in the United States, he felt fortunate to then be able to devote more time to collecting, buying and selling Native American Indian Baskets. Mr. Quintana has an extensive collection of antique Native American Indian baskets, especially those originating from California and Nevada, Native American Indian Tribes. He also has assisted with basket appraisals. He soon became nicknamed the "Basket Man" and presently advertises "Baskets for Sale" and "Baskets Wanted". Yosemite National Park, Yosemite, California, donation, 1982-1995, California Indian Basketry. Scottsdale Center for the Arts, Scottsdale, Arizona, Feb. 1998 - April 1998, Exhibit, "With Beauty All Around Me, Art of the Southwest"
The Crocker Art Museum, Sacramento, California, Aug. 2006 - Nov. 2006 Exhibit, "Fine Art of California Indian Basketry"
Autry National Center, Oakland & Los Angeles, California, May 2007 - Sept. 2007, Exhibit, "Yosemite: Art of an American Icon"
North Tahoe Historical Society and Museum, Tahoe City, California, May 2005 - Jan. 2009, Exhibit, "Woven Legacy: A Collection of Dat-so-la-lee Works, 1900 - 1921"